The Duchess of Cambridge carried out her first official solo engagement tonight, visiting one of her patronages The National Portrait Gallery to view the Lucian Freud Exhibition. Lucian Freud is widely considered the best figurative artist of his generation. This exhibition entitled 'The People In My Life' is being described as a fitting farewell to Freud who died last year. Insightful paintings of the people closest to him demonstrate the drama and depth to his work. Featuring over 100 works from museums and private collections throughout the world, the exhibition is being hailed as the event of the year. Officially opening to the public tomorrow, you can book tickets here. "I've always wanted to create drama in my pictures, which is why I paint people. It's people who have brought drama to pictures from the beginning. The simplest human gestures tell stories". Kate told photographer Mary McCarthy (daughter of Paul McCartney) she has been looking up her work and was hugely impressed by it. Kate toured the gallery and admired the collection of portraits, As an Art History graduate, Kate will be familiar with Freud's style. Kate decided to choose a different designer for this occasion. Wearing a beautiful tweed, grey dress coat with a large shawl collar, designed by Joyce Stewart from Jesiré. Jesiré is a high street label stocked in department stores, but unfortunately this is one Kate piece fans won't be able to get their hands on as Jesiré went into liquidation last year. Kate bought the dress in 2010 for the sale price of £60. Kate was the picture of understated elegance. I love this look and there's something rather 1950s about the silhouette. What do you think? "These black suede, almond toed Jimmy Choo's cosmic shoes are five inches high with a one inch platform. Jimmu Choo's black suede pumps provide a chic foundation to any outfit". Kate accessorised with her black suede clutch and a detailed belt. Tonight's engagement is one of many for Kate this year. On June 4th, The Duchess will attend The Queen's Diamond Jubilee Concert. Artists from every decade of the Queen's reign will perform. Stars Paul McCartney, Tom Jones, JLS, Elton John, Shirley Bassey and Cliff Richard have been confirmed to play at the historic event organised by one of Kate's favourite singers, Gary Barlow. 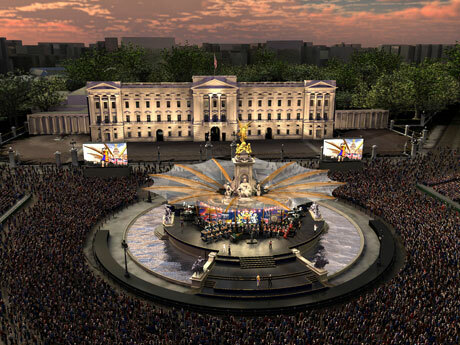 The concert will take place outside the front gates of Buckingham Palace. Now for the really exciting part... 10,000 free tickets will be available via ballot until March 2. For more information on the tickets Click Here. I love her coat dress!!!! It's very very elegant! :) Kate seems very relaxed and she's beautiful and sweet:) I like very much her look:)! Any idea what necklace she is wearing? Cute shoes. Too high of heel for me, but they go great with the dress. I've never heard of Jesire before, where can you buy it? I think Kate looks lovely as always, although I was hoping she would wear some colour! Love how she looks! Allthough i was hoping for some color too, i think she looked great! But wasn't she cold?? Its extremely cold outside (most of the time she wasn't outside but nevertheless). Thank you for the quick post!! You're the best! She looks amazing. We love her. Go Kate! Love the outfit....is her hair a good bit shorter than usual?? I agree that her hair is shorter. It looks very healthy at this length and more age friendly. she does look great . I liked her dress.. she look excited.. Lovely pictures... thank you..
She looked really great but her legs looked quite pale. I think her hose were the wrong color since she's probably nice and tan from her vacation. i agree, def needed tan hose. esp for an evening event. Yes, darker hose for evening. Where is her coat ? She looks fantastic and absolutely stunning! Very different from her latest picture, when she looked very exausted. Her dress is gourgeous! The hair is soooooo shiny! Can't imagine a better way for her to start this new fase as a royal. I'm a huge fan of hers! I hope we can get to see more picture of this amazing evening! She looks amazing! Kate also appears so calm while William is away. If I were her I would be a wreck. Thanks for the amazing post! Thank you for all your comments, I love reading them and hearing your views! I loved Kate's look tonight, a new designer and the 1950s look is just gorgeous on her! Wow! Kate's dress might only cost £150, but it looks like a million bucks on her! She truly looked lovely for this outing. I'm so glad she's going to be in the public eye more! I never get tired of looking at photos of her gorgeous face and hair and, of course, picking out what jewelry she's wearing. And yay! for her wearing her diamond bracelet -- what's the point of being a princess if you can't sport a few rocks, even to go look at some art? Kate looks amazing! These are such great pictures. I am totally obsessed with that coat! She looks fantastic - I love the silhouette and the colour is perfect for winter! Her hair does look a bit shorter and her makeup looks particulary good, it's great to see her going solo after all alot of attention is focused on her now rather than William so she is probably in a better position to do good, especially while he is unavailable due to work! She couldn't have been more elegant or confident (I give her credit!). And you're so correct, Duchess... I couldn't put my finger on it, but the look is 1950's. Very appropriate for the venue IMO. I have a feeling William is just beaming with pride at his beautiful wife's success. what a gorgeous tan she has from her holidays!! i am very jealous!!! Oh my goodness, the Duchess looked very stunning tonight. She looked very relaxed but I bet she had butterflies. Hope her Prince will get to see these beautiful pictures of his beautiful Duchess. Loved the dress and shoes. But is that her engagement ring on her finger or another diamond ring? It is hard to tell. Maybe it something her Prince gave to her before he left on his deployment. Anyone know? @Jackie, I bet she was nervous. Remember she is used to having her Prince by her side but yes she did look calm. Can you just imagine what was going thru her mind. My sister was thinking Kate' hair is looking a little darker?? I love that she chose high street for a big event like this, such a pity the company are gone into liquidation. Pity indeed. :( I bet the former owners wish she stepped out in one of their outfits a long time ago. It looks a little like she's wearing the earrings she's previously paired with that bracelet, instead of the Links of London set. But beautiful all the same! The photographer Mary McCartney is Paul McCartney's daughter and sister to Stella McCartney. Absolutely gorgeous!What a lady!Love her style!And..ohhh my gosh what a hair this woman have!!!!!????Perfect!! I just had a thought maybe she is once again taking inspiration from Princess Grace of Monaco,the first time being her wedding dress, seems she is a fan! I agree it's very 50's and I particulary like the shawl collar, similar to what Grace Kelly wore! Love the ensemble, I can't wait to see what wardrobe pieces she will debut this year! You know I thought the whole look was very Grace Kelly as Soph said. Classic elegance is always fashionable. LOVE this outfit! One of my favorite Kate looks for sure. Am I the only one who thinks she looks like shes hiding something? Very true. :) She will do wonders for the economy and I don't mean to sound funny. I absolutely love her dress. I love the double-breasted front. Duchess Kate, I had the same thought that with Kate wearing this dress, the company could go back into business. There will probably be alot of people wanting this dress. Kate is so graceful and I really enjoy seeing her out and about. You do such a great job with your blog and I love it. i don't like the shawl collar - it looks her shoulders are scrunched up. and i think the tweed dress, and pale hose, would be better for a day event not a gallery opening. for a gallery opening, esp of a such a modern and innovative painter, i would have preferred to have seen her in something younger and hipper, and, at the very least, more appropriate for an evening function. save the 1950s style tweed dress, with a fussy collar, for a day event with the queen. This is her best look yet. With her long-waisted frame and smaller bustline, many of her choices have left her silhouette unbalanced. The shawl collar gives her width at the shoulder, accentuates her tiny waist and a bit of curve at the hip. Bravo, Kate! I have a question... If this is the coldest winter in the UK, where are eveyone's coats, hats and gloves? BTW- I think she looks nice. Super dress - quiet and sober, just right for this engagement. She must have been cold talking to that chap on the pavement though - it is bitter in London! I hope she enjoyed her evening. Love from Indonesia Kate...you always beautiful and amazing! You can put a sack on this girl and she will look gorgeous! But I do think she could have worn something a little more young and fashion forward that still would have been appropriate for the event. I'm the only one to think that her hair is looking a little darker?? Where is her coat ? Ciao a tutti! Sono una lettrice italiana, scusate se non scrivo in inglese, ma rischierei di fare troppi errori, quindi spero che qualcuno mi possa tradurre. Purtroppo a parere mio, questa scelta d'abito, non è stata proprio la migliore. Innanzitutto si vede tantissimo che il cappotto è di basso profilo, i bottoni non c'entrano nulla con il resto del capo e quel colletto la fa goffa perchè non è stato cucito da mani esperte, bensì da un macchinario. Si vede proprio tanto. La parte bassa del cappotto è migliore. Altra nota dolente sono le scarpe che possono andare benissimo per una serata di più alto profilo, però con un vestito più impegnativo, era perfetto l'abbinamento con il vestito nero in velluto: Vestito elegante=scarpe eleganti e in quell'occasione ci stava anche il plateau che invece in questo caso era davvero troppo. Quasi volgare per una Duchessa e non una normale Duchessa ma la Duchessa di Cambridge, sfoggiare scarpe con un plateu così alto, abbinandolo ad un abbigliamento del genere. Ultimo punto le calze, proprio mal abbinate quelle calzine così velate ad un tacco così alto e ad un cappotto grigio... Mi dispiace molto criticare Kate perché la adoro, ma quest'ultima scelta di abbigliamento non mi è proprio piaciuta! Does anyone have information on her gorgeous necklace?